Enjoy two hours in a beautiful location with a few like minded folk - no more than 12 on any walk. Joe on hand to guide and advise on all aspects of using your camera and getting the best shots. You use your own kit (any camera make or size is fine), and can ask questions and be shown how to take better shots and master new techniques. No pressure, and everyone goes home knowing more, and with good photos in the bag! ALL ability levels welcome, from complete beginner to experienced shooter. Only €40 per person. Visiting Dublin - want a personal walk or outing for you and up to 3 friends? Check out the video on the right, and give me a call - 086 384 3670 joe@houghtonphoto.com. A magical evening shooting the Christmas lights on Grafton Street, Henry Street and O'Connell Street, finishing up at the GPO for the huge tree there. We start in front of the Stephen's Green Shopping Centre at the top of Grafton Street - just look for the group with tripods :). This is typically a very popular walk, and will be strictly limited to 12 participants, so book early through the PayPal link here to avoid disappointment! Joe will be on hand to assist everyone so if this will be your first try at night photography, worry not! It's easy, and you'll have lots of fun getting some smashing shots to share with friends and family. (You do need a tripod for this walk - hand-held night shots get very blurred! Not got one? - give me a call on 086 384 3670 when booking - I have a couple of spares. A new walk for 2017, this amazing structure was built by a local landowner during the Famine to provide locals with employment, and is a lovely spot for some photography. Located just off the N4 near Celbridge, it provides a great afternoon's shooting and some really different images for your collection! Google map is HERE - you park on the road in the estate (Elton Court) just outside the entrance then walk the few hundred yards up to the Barn. A new route for 20117 - a spectacular walk along the river Liffey shooting the bridges and buildings reflecting off the black waters. You'll shoot the Convention Centre, Beckett Bridge, Customs House, IFSC, O'Connell Street Bridge and the Ha'Penny Bridge, getting dusk and then night shots, traffic trails plus lots more... We start in front of the Convention Centre - see the Google map HERE. Everyone goes home with lovely shots! 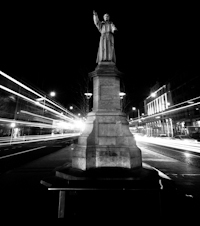 Joe will be on hand to assist everyone so if this will be your first try at night photography, worry not! It's easy, and you'll have lots of fun getting some smashing shots to share with friends and family. You need a tripod for this walk - hand-held night shots get very blurred! Not got one? - give me a call on 086 384 3670 when booking - I have a couple of spares. Normally a very popular walk, so we will limit this to 12 - first come first served, so early booking is advised - use the PayPal button top right now to secure your place! A photo filled walk around one of Ireland's most historic and beautiful sites. The round tower and ruined church, river and surrounding hills make this a very special place to take wonderful shots. Park in any of the main carparks around the Visitor's Centre and we'll meet at the stone archway by the hotel before heading up towards St Kevin's and the round tower. Google map HERE. (If you have a tripod I would bring it but it's not essential). Wear good stout shoes for this walk - it's mostly pavement/gravel underfoot but we'll be on the riverbank at one point so a good grip on your soles will help. The weather forecast for the Vale of Glendalough can be accessed HERE. This lovely forest park around a lake filled with ducks and moorhen provides a leisurely stroll with many chances for woodland, nature and wildlife shots in a location only 30 minutes drive from Dublin. Park in the car park (it's €5 euro in - you'll needs coins to get through the barrier) and we'll head for the lake, passing the ruins of Aylmer Castle as we go. Google map here. If you have a tripod I would bring it but it's not essential. A beautiful woodland meander and the magnificent stately house all provide ample opportunities for varied shots which can be processed into wonderful images later. The new walk down by the lake is a great addition to the demesne which gives some lovely opportunities to shoot the house with water and reeds in the foreground. We meet in the car-park - see their Visitor Information page for map, GSP and directions. NEXT WALK: TBA, or call me to set one up! A leisurely evening stroll along the beautiful banks of the River Liffey in Lucan, on the border of Counties Dublin and Kildare. Beautiful river and reflection shots, macro images of flowers and tree bark, heron are normally around, and there's a little waterfall to shoot as well. We'll meet up in the Lucan Demesne car-park at the bottom of the slip-road opposite MacDonalds and the petrol station - see MAP. If you have one, bring a tripod for this shoot (or borrow one off me) as we can use it at the waterfall for some misty water shots. One of Dublin's best horticultural attractions, there's loads to shoot wherever you turn once you're in the gates! Flowers, squirrels, the lake, a waterfall, glasshouses, loads of great photo opportunities. We start at the Botanic Gardens Glasnevin car park – see MAP. There's a €2 coin parking fee in the car park, and it gets full, so come early :). Date and Time : TBA, or call me to set one up! These beautiful gardens in Ashford, Co. Wicklow are less than an hour from Dublin, and provide wonderful opportunities for river, flower and nature photography. And there's a lovely tea-room as well. Meet in the car-park of the Gardens - see their website for directions. Note: The cost of this walk (€47.50) includes the €7.50 admission charge to the gardens. One of my favourite little coves near Kinsale, this is a wonderful area to explore beach photography We'll meet on the little bridge - you just park up along the road and we'll shoot on the beach - see MAP. The magnificent formal gardens of Powerscourt House in Co. Wicklow are an amazing place to capture wonderful shots - vistas of the house and lake, macro close-ups of flowers, there's so much to shoot! Pay your own way in (depending on whether you want to tour the house as well) - for the photo walk we'll all meet up at the top of the steps overlooking the gardens. Google map HERE. (If you have a tripod I would bring it but it's not essential.